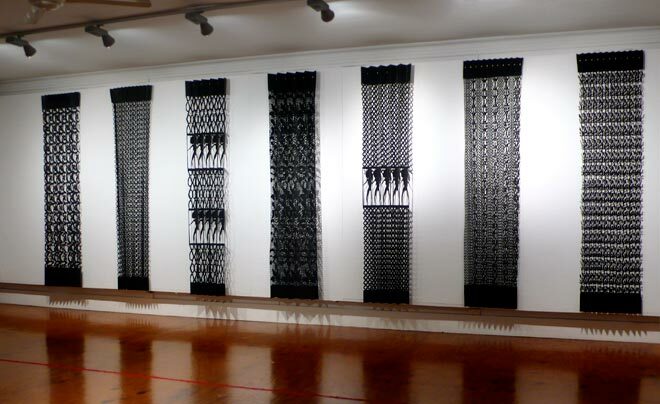 Lonnie Hutchinson is an artist of Māori (Ngāi Tahu) and Samoan ancestry whose signature works comprise decorative cut-outs on black builders' paper. These pay tribute to the traditional arts of Pacific and Māori women, including tīvaevae (appliquéd and patchworked quilts) and kōwhaiwhai. 'Before sunrise' (2010) consists of seven dramatic 'veils' representing the Seven Sisters – the constellation of Matariki (Pleiades). The intricate panels incorporate abstract patterns and representational elements, such as hand-holding Polynesian dolls.